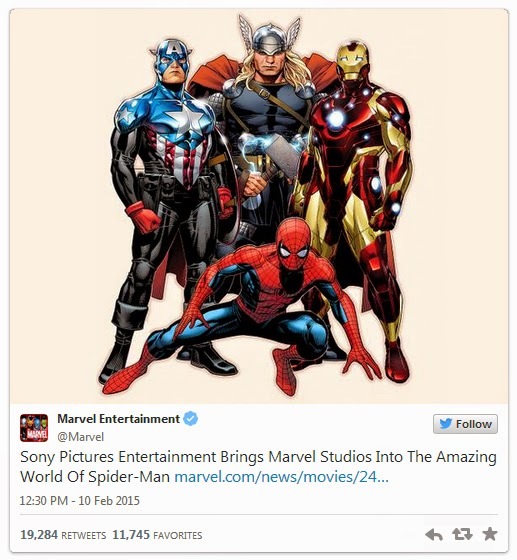 Spider-Man will appear in upcoming Marvel movies. A deal has been announced between Sony Pictures and Marvel that will see a new version of the web slinger appear in an as-yet-unspecified movie in the Marvel Cinematic Universe — the same universe that contains Iron Man, Thor, and the rest of the Avengers. Marvel and Sony are looking to cast a much younger Spider-Man than moviegoers have ever seen on film. In a new report on the project, the studios are reportedly looking for an actor "much younger" than Andrew Garfield, currently 31, to portray the next Spider-Man and Peter Parker. Garfield first played Spider-Man in The Amazing Spider-Man when he was 29 years old, and Toby Maguire first played Spider-Man when he was 27 years old. The timing of the deal means Spider-Man's likely to make his first Marvel movie appearance in Captain America: Civil War in May of next year, but the agreement doesn't mean that Sony is giving up the movie rights to the character. The studio will continue to finance, distribute, own, and have "final creative control" of standalone Spider-Man films, but Marvel Studios will be coming in to co-produce the next entry, now slated for July 28th, 2017. Sony Pictures said it was also "exploring opportunities to integrate characters from the Marvel Cinematic Universe into future Spider-Man films." The new Spider-Man franchise will receive new stars behind the camera as well. While it was announced last night that Marvel Studio’s Kevin Feige and ex-Sony chairman Amy Pascal would produce the film, the new report from The Hollywood Reporter reveals that producers Avi Arad and Matt Tolmach will lose much of their creative control. Tolmach and Arad were the main producers on the recent Amazing Spider-Man reboots, and Arad has overseen the cinematic Spider-Man since Sam Raimi’s first Spider-Man film in 2002. Now, they will only be executive producers--a much more "hands-off" position--for the 2017 reboot film. Though Marvel and Sony will collaborate on directing Spider-Man’s future, Sony will ultimately get the final word on all creative direction.